ONE of Andalucia’s most emblematic restaurants has fallen from the sky. 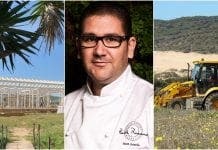 Tragabuches – the first restaurant in Andalucia to be awarded a Michelin star – has been stripped of its accolade due to poor performance. This was despite it being much lauded by French culinary icon Jean-Christophe Novelli who sang its praises on numerous occasions. Meanwhile, its former chef Dani Garcia, who earned the restaurant its first star, has moved on to bigger and better things. he now has two stars at his Marbella restaurant Calima. There was also fabulous news for Cadiz fish restaurant Aponiente which won a much deserved first star in the latest round of nominations by the French food bible. Chef Angel Leon has made his name by cooking only with sustainable fish. Meanwhile, the Santo restaurant in the EME Cathedral Hotel in Sevilla also joined the list of those awarded first stars. It is owner Martin Berasategui’s seventh restaurant in Spain to be awarded a star. Previous articleWir sprechen Deutsch in Montejaque! Sad for Ronda, but being knocked down a peg or two was over-due. Garcia and his kitchen crew made Tragabuches destination restaurant; its shining moments were 1999-2001. After that, it was never the same. I believe local Ronda owners ruined Tragabuches over a period of several years. There was substantial staff turn-over, and the wait staff was poorly trained. The owners of Tragabuches are the same folks who own Escudero, a nice place for lunch or a summer dinner, but a tour-bus destination nonetheless. Back to ‘meat and chips’ then for the Ronda residents lol. ” what goes round , comes round ! ” the greedy owners havent been paying the staff there for months yet lola continues to flaunt herself around ronda in her convertible bmw and fancy clothes!! the place was overpriced and over rated anyway ! hope they fall on even harder times.